I recently purchased the following Kate Spade bow belt in a color which is apparently exclusive to Nordstroms. This color is aptly named, Mint Cream. When the belt arrived a few days ago, I was officially smitten. I'm glad that Kate Spade makes this particular belt in Italy and the quality certainly shows. They had a similar style belt (in brown) at Target that was made from PVC and priced at $19.99. 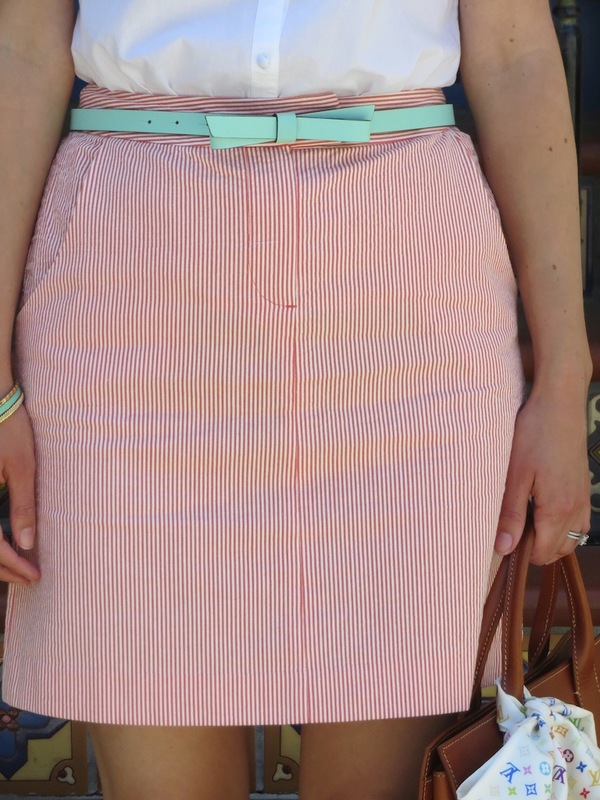 I paid double that for this belt (it was on sale) and it was worth every penny. This bow belt will compliment a wide array of skirts and dresses, but today I decided to wear it with a seersucker mini skirt from Marshalls. The skirt was only $17, so you can't beat that. I thought the pastel orange stripes of the seersucker would look great with the mint. 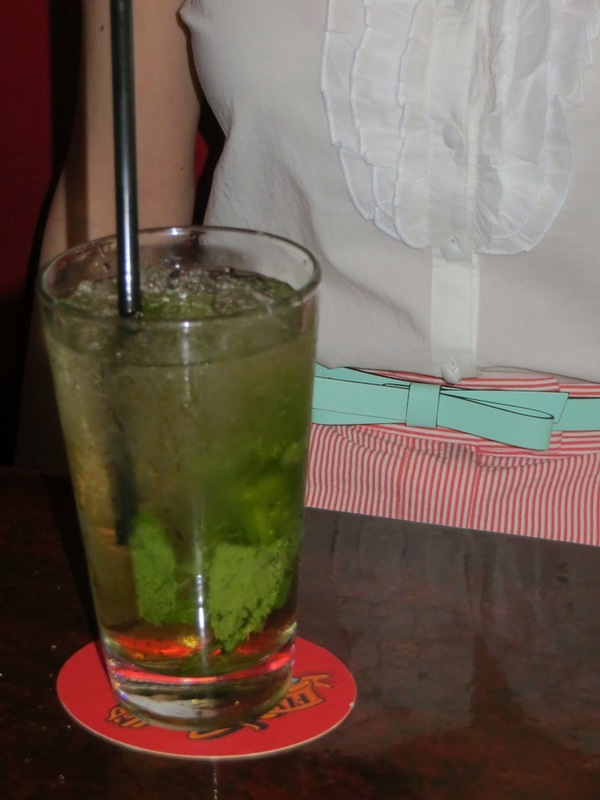 Very refreshing for summer. 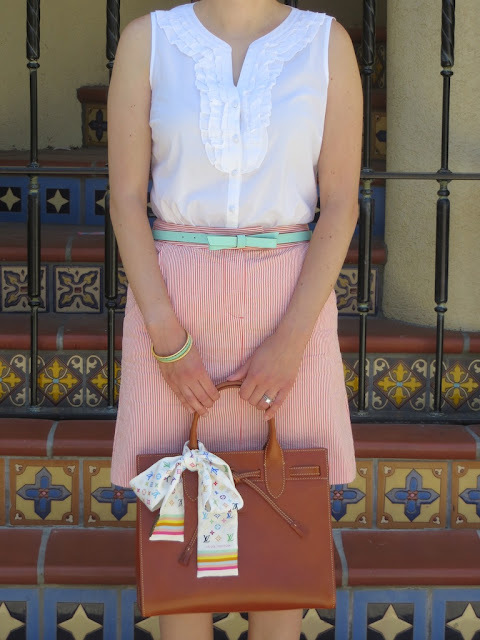 My husband commented that I looked like a candy striper, hence the title of today's post. Since it was such a hot day, and I was in such a minty mood, I had to order one of my favorite cocktails, the mint julep. I would have preferred it in a traditional pewter cup, but hey, I'm not picky. This last picture really doesn't have much to do with anything except for the fact that the fountain featured here has a mint patina to it and I thought it was cute. Who doesn't love a cute little sheep? Oooh, made in Italy you say? You had me at that! Such a great outfit! I'm jealous of your warm weather... we have fog! Thanks! You probably don't want to hear this, but I would love some fog. It's too hot here! Thank you! The bow is the mint icing on the cake!